As was revealed back when the movie was still in the early stages of production, Marc Webb's The Amazing Spider-Man 2 will feature a whole new look for Andrew Garfield's version of the superhero as the character has gotten a costume upgrade. But now we have the chance to get a detailed look at it. You can see the image above, but heading over to the Entertainment Weekly site will yield even more about the suit. 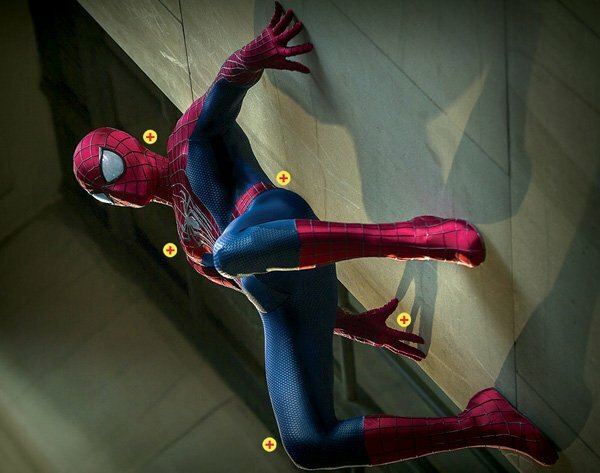 Not only will you see a bigger image, clicking on each of those yellow dots provides info about ways in which the suit for The Amazing Spider-Man 2 is different than the first movie. As many have noted, the most notable change in the costume is the eyes on the mask. In The Amazing Spider-Man, Webb decided to go for a smaller design with a yellow tint - but that apparently went out the window for the new movie. Instead, the eyes take up almost half of the mask and are bright white - just like in the Ultimate Spider-Man comics that have inspired the rebooted series thus far. The film's director gloated to the magazine about the redesign, saying, "We've got the best eyes of any suit. Really big, very warm white eyes." Next we have a classic Spider-Man accessory that didn't make it into the last movie: the belt. Webb undid some of the changes that Sam Raimi made to the character in his movies by once again having Peter Parker make his own webshooters, but one key detail that he forgot was the utility belt that Spidey uses to store his extra webbing. That part of the costume design will be back for The Amazing Spider-Man 2, but it may not be functional. Said costume designer Deborah Lynn Scott of the addition to the suit, "Why exactly does Spidey need a belt? I don't know. He just always has. There are rules to comic-book characters." Also being given an update is the famous spider symbol on the superhero's chest, which, believe it or not, is actually being constructed as an homage to the Raimi era costume. In addition to talking about how they designed the symbols look on a computer in 3D form, the magazine says that "the little red-brick pattern" behind the symbol "is intended as an homage to the Tobey Maguire-era suit"
Be sure to head over to EW's site to read about how they decided to change the coloring and shades of the suit this time around and how the mechanical webshooters will be getting an upgrade. Scripted by Alex Kurtzman and Bob Orci, The Amazing Spider-Man 2 will see the continuing adventures of Garfield as the masked superhero as he continues to try and balance both his secret and personal lives. The movie promises to introduce a number of new characters from Spider-Man's long history, including Harry Osborn (Dane DeHaan), Max Dillon a.k.a. Electro (Jamie Foxx), Norman Osborn a.k.a. The Green Goblin (Chirs Cooper) and Aleksei Sytsevich a.k.a. The Rhino (Paul Giamatti). Also set to reprise their roles from the first movie are Emma Stone as Gwen Stacy, Sally Field as Aunt May and Martin Sheen as Uncle Ben. Colm Feore, Felicity Jones, B.J. Novak, and Sarah Gadon have been confirmed as being in the movie as well, though their roles have not yet been revealed. The Amazing Spider-Man 2 will be in theaters on May 2 , 2014 and stay tuned next week for all of our coverage of the film at San Diego Comic-Con.